Lightly oil grill. 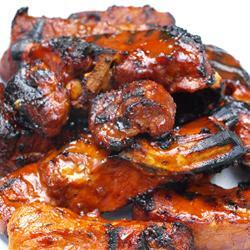 Remove spareribs from the stock pot, and place on the prepared grill. Use the barbeque sauce in the saucepan to baste ribs while cooking. Grill ribs, basting and turning frequently, for 20 minutes, or until nicely browned.